These Baked Parmesan Green Bean Fries are coated with a mixture of Parmesan cheese and spices, and then baked until golden. Crispy, crunchy, and full of flavor, these healthier fries make the perfect appetizer or easy side dish! When I was in high school, my friends and I loved getting a big group of us together to go out for dinner. And one of our favorite spots was a a diner-type place that served the best fries. Their menu was good and the prices were even better, especially for high school students! The restaurant we used to frequent is no longer there, which is probably for the better, since my tastes have outgrown that place. But, I do miss that restaurant for one reason: their green bean fries! Green bean fries are pretty well-known by now, but years ago, they just weren’t a thing. I can remember the first time I ordered the fries as an appetizer…man, were they good! I never knew green beans could taste so crispy and zesty. Fast forward years later, and I still think about those green bean fries. And even though they’re available at a lot of restaurants these days, I hardly ever order them. So, when I got a craving for them a few weeks ago, I decided to make my own version of my old favorite. These Baked Parmesan Green Bean Fries are coated with a mixture of Parmesan cheese and spices, and then baked until golden. Crispy, crunchy, and full of flavor, these healthier fries make the perfect appetizer or easy side dish! 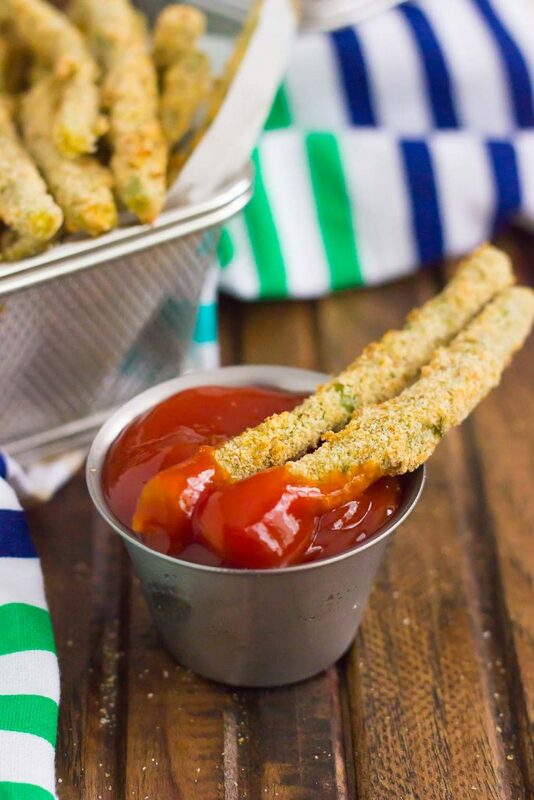 And trust me when I say that these Baked Parmesan Green Bean Fries are addictive! I didn’t even try to resist the temptation…I think I ate them all! Well, I take that back. Since the hubster is my official taste tester, he did sneak a handful (or two) of these babies. And even though he’s not a big lover of green bean fries, he did think these were pretty amazing. I attribute that to the mixture of Parmesan, garlic, bread crumbs, and onion powder. Man, oh man, does that create the most delicious seasoning! Now, like most of my recipes, these green bean fries are so easy to make! But, you knew that was coming, right? And since they’re baked, it just means that you can sneak one (or ten) more than the fried kind. See? I’m always thinking! 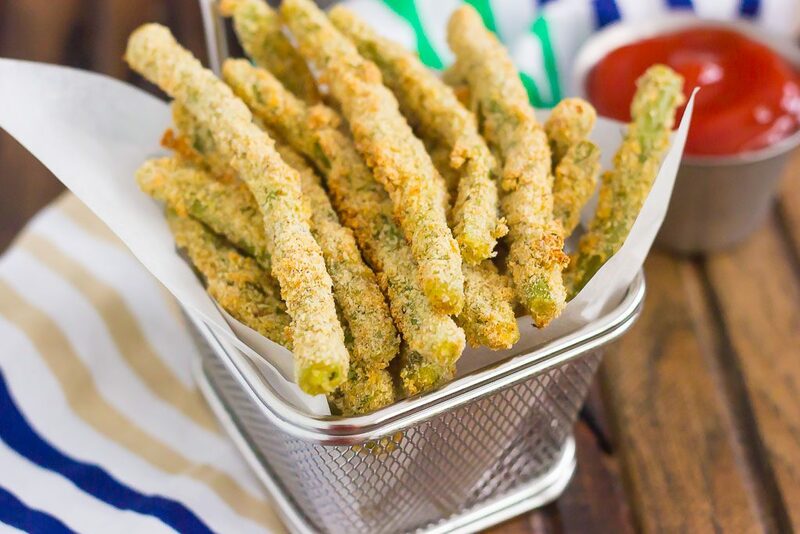 Once you bite it’s these Baked Parmesan Green Bean Fries, you’ll fall in love with the crunchy texture and flavorful coating. This version is the best way to take those ordinary beans and turn them into something extraordinary! 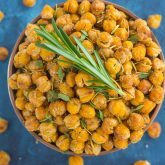 Serve these cuties with some ranch dressing or ketchup, and you have a delicious dish that’s just begging to be eaten! 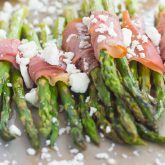 Looking for more easy appetizers? I’ve got you covered! These Baked Parmesan Green Bean Fries are coated with a mixture of Parmesan cheese and spices, and then baked until golden. Crispy, crunchy, and full of flavor, these healthier fries make the perfect snack or easy side dish! Preheat oven to 425F. Lightly grease a large baking pan with non-stick cooking spray, or cover with parchment paper. Set aside. In a medium bowl, stir together the bread crumbs, Parmesan cheese, garlic powder, onion powder, salt, and pepper. In a shallow baking dish or small bowl, whisk eggs. Dredge beans in flour mixture, then dunk in egg mixture, and then coat in the bread crumb mixture. Place beans in a single layer on prepared baking pan. Repeat with rest of beans until all are coated in bread crumb mixture. Bake for 10-12 minutes, or until coating turns golden brown and starts to crisp. Serve with ranch dressing or ketchup, if desired. Since I eat green beans all the time like fries, this is just the next step! Coating with parm and other goodies must make them totally irresistible. Must be so much better than the deep-fried kind! Hi Shirl! I've never used frozen green beans, so I can't say for sure, but I'm thinking they would work. Hope you enjoy these if you try them! We love fries in our house, but veggie alternatives like this are a great way to keep us healthy. I haven't tried a green bean version yet, so I will have to give that a try. Great idea Gayle! Thanks for the green bean love, Nadia! Yes! I love creating my own restaurant versions...so fun! Thanks for the kind words and pin, Dawn! I've always loved green bean fries, but now can never get them out since being gluten-free. For some reason, it never really crossed my mind to just make my own! I think I know what I'll be doing with the green beans that are in my fridge ;) Have a great weekend, Gayle! Thanks for the kind words, Keri! Hope you have a great weekend, too! I still need to try green bean fries! I will admit I'm not the biggest fan of green vegetables but I am a big fan of FRIES so I think it's worth a shot! Plus, I'm sure my kids would love them! These look SO crispy and yummy! The hubs and my kiddos LOVE green bean fries - it's the only way they'll eat them haha :) Baking them with parmesan sounds perfect! Mmmm - I love the combination of Parm and green beans...and in the form of fries? All the better! 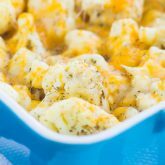 I love how you tapped into a nostalgic moment to creaet this awesome recipe! Thanks, Annie! These fries definitely take me back down memory lane! Thank you, Medha! I love that these are healthier than the fried kind! These look super crispy and delicious! I also love the little basket that you photographed them in! Gayle, I've never had green bean fries!!! 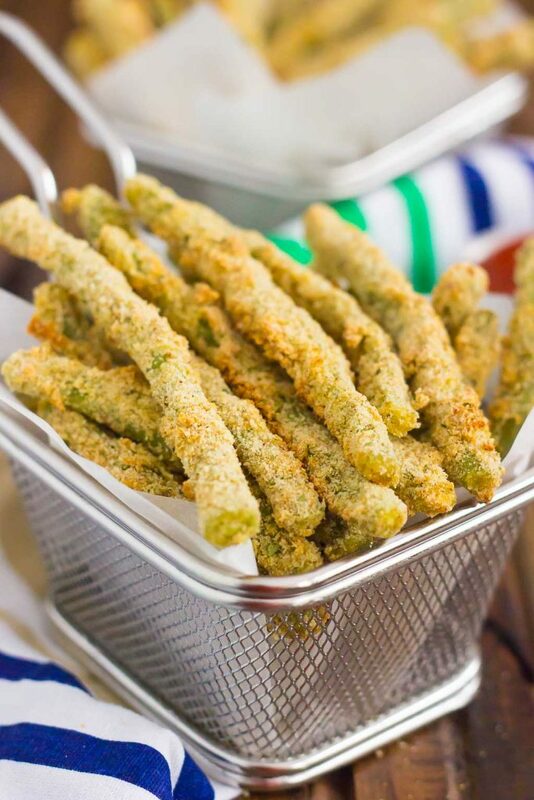 love these parmesan green bean fries and can't wait to try this!!! happy friday! Thanks, Alice! Happy Friday to you, too! I LOVE this idea! I always cook green beans <-- boooring ;) This looks amazing, and I bet it taste perfect! I'm sooo going to make this! Thanks for the recipe. Sharing off course ;) Have a great weekend Gayle! Oh wow! 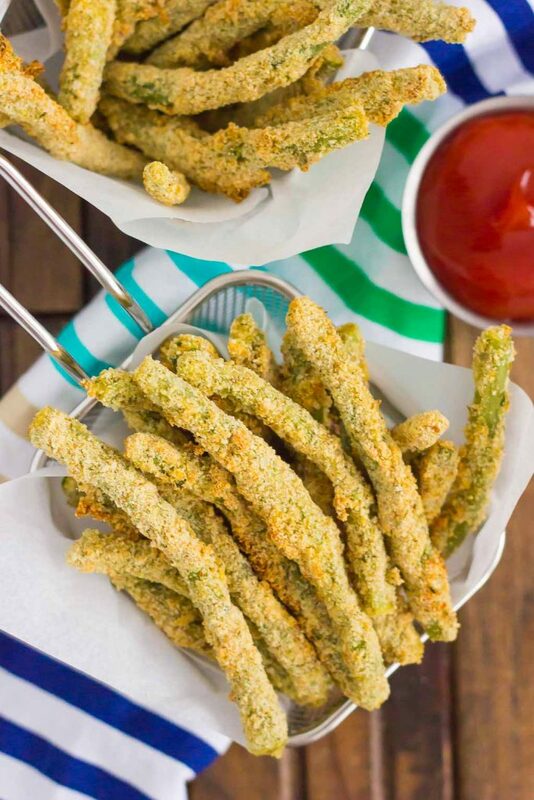 I love fried green beans and these look like they have such a wonderful crunchy texture but I love that they are baked instead of fried! I love green bean fries! Love the addition of parmesan! Thanks for the green bean love, Jessica! I love green beans! turning them into fries with a crispy parmesan coating is genius. And it's even better that they are baked. I am totally craving this now! I love eating crunchy fried beans but since these are baked I know I can eat a lot more!! Perfect for weekend Gayle! Hope you have a good fun weekend girl! Thank you, Ami! Hope you have a great weekend, too! Loving these fries, they look so crunchy! and they are baked which means I can have the whole tray! Yes! Baked is always better, right? :) Thanks, Manali! Look at you, making delectable fries all good for us! This is definitely going right to the top of my must make list - our local farm market is swimming in fresh green beans. Yay! Thanks, Kate! This is my new favorite way to eat green beans! OMG Gayle, I've never had green beans like these! They look perfect! Can't wait to try them! Thank you, Megan! Green bean fries are the best! Oh my gosh, fried green beans are seriously one of my favorite things in the world. 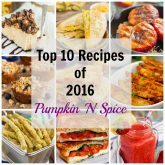 I LOVE that you came up with a baked version - so much healthier! I seriously can't wait to try these :). Is the flour necessary? I know a lot of people,are trying to go white flour-free. Just wondering. Hi Stacy! I have only made this with flour, so I can't say for sure if you can disregard it in this recipe since it's a binder for the ingredients. If you're looking for a gluten-free or flourless recipe, I'm sure there are ones out there. Thanks for stopping by!